I nearly choked on a Swedish fish when I read Grace’s email inviting me to be a guest post on her blog. It’s such an honor to be here Grace, again, I just wanted to say thank you for sharing your space with me this week. Hi everyone! My name is Marichelle and you can usually find me over at Heart Handmade. I like to think of it as a place where you can go and discover the many stories behind the world of handmade and indie designs. This week I’ll be drawing from some of my regular features to help share some stories that I hope you all find interesting and inspiring! I’d like to start off with a feature called “Heart Lab” and share the source of one of my most treasured item in my new home. Not too long ago me and Hillsy (my boyfriend) decided to embark on a little adventure to the burbs. So we packed up all of our belongings (not much) from a 500sq’ studio apartment in the East Village and headed to our first home in Maplewood NJ. Little by little we’ve been filling it with found items from yard sales but our dining table was our first big splurge. I always dreamed of having a huge table in a house where we can hang out and eat, talk, laugh and…well… basically create memories. I wanted something that would last forever and I’m so happy to say we found it. Here’s a snapshot of our 8½ foot long and 3½’ wide English Tavern style dining room table handcrafted by David Ellison of Lorimer Workshop. I don’t really remember how I found David, all I remember is that it was one of the most painless and enjoyable things I went through during our hectic move to the burbs!! I got in touch with David last week to ask him to be a part of my week here. He kindly agreed to answer a few of my questions and also give us a first-hand look at his process. Enjoy! 1. It’s always inspiring to hear stories of people who take a passion and turn into a means to make a living. How and when did you decide to make that leap? My life has taken many interesting and unexpected turns, and has taken me many places. Somehow, though, this current phase of my life seems to draw upon so many parts of my experience, fitting it all together in ways I couldn’t have imagined just a few years ago. I was born in Glasgow, Scotland. My mother was trained as an architect, an unusual thing for a woman in those days. Even though she never worked professionally, we would often spend our weekends traveling around the countryside admiring old houses, just to look at the forms and materials. We moved around a lot and lived in many wonderful houses, as well. Farmhouses, cottages, even an old castle. As a child, I felt a kind of joy and mystery in old things and, especially, old furniture. I was always captivated by the stories that well-worn furniture could tell. When I was a teenager in London in the 1960s, I worked for an antiques dealer named Mr. Hamilton (no one ever knew his first name) and I learned to restore antique furniture from him. I also sold furniture in the markets, and got to know many of the flamboyant characters who traded in antiques around Chelsea in those days. When I first came to America, I found a job in manufacturing. It never occurred to me that I would be doing that for the next twenty-seven years, moving from production into the corporate world. 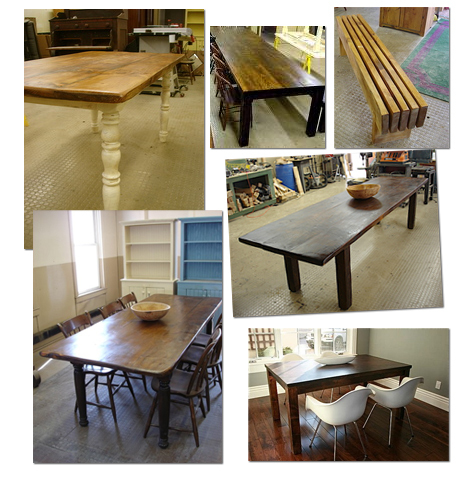 After a number of years, I started to restore and sell antiques and furniture again, just as a hobby. Soon it became a little side business that I did on the weekends and in the evenings. As the years went by, that part of my life became even more important to me, and the business grew. Finally, well into my fifties I decided to take a big leap. I left the job and company I had enjoyed for all those years because I wanted to do the thing that I loved full-time. I wanted to work with my hands, and develop my knowledge of furniture and old things and create special objects. I wanted to have control over my life and build my own business. 2. When you work for yourself the hours are somewhat un-conventional. There’s no such thing as a 9-5 day. Can you switch off from work and, if so, how do you do it? Now that my career and my passion are the same thing, I don’t really think of it as work anymore. I spend many, many hours in the workshop, speaking with customers, delivering tables, and thinking about the business. I start very early in the morning and keep going into the evening, even on the weekends. But there are few things I enjoy more than this. This is simply what I love to do. And at the end of a long day, I like to settle down with a glass of wine. 3. If you weren’t working on your own creations, is there an alternative career that you would’ve liked to pursue? I can’t imagine doing something other than this. The truth is, I’m doing exactly what I want to do. My only regret is that I didn’t start sooner! It’s hard to imagine anything more exciting than a young couple buying their first real piece of furniture, as many of my customers are. They have a feeling that they are designing something that will be at the very heart of their home and family. It’s so much fun to collaborate with them on that, to help them create a centerpiece, something that will be a part of their daily lives, that expresses something important and personal about the kind of home they want to create. It has so much significance for them. What could be more fun than that? I’ve also been exposed to so many creative people: designers, architects, artists, small-business owners. It’s been a great thrill, especially at this phase in my life, to have the chance to work with so many talented, energetic, and interesting young people. 5. What’s the most satisfying piece you’ve worked on, or the piece you’re the most proud of? Just recently, I finished an enormous sixteen-foot table made of old hickory, which was a challenge but also very exciting. The client brought me the wood, which I had never worked with before. Every kind of wood has its own character and unique qualities, which is why hand-made wood furniture has such a special personality. But the most special experiences are always created because of the relationships I create with the customer, and the very enjoyable process of creating something that meets their needs and brings them joy. I worked recently with a wonderful young family. The husband was about to deploy to Iraq. His wife told me that the process of designing their own table gave them a lot of comfort and pleasure during a difficult time. She asked that I include the husband in our email conversations, so that he could be a part of process while he was overseas, and that he could think about the new family-heirloom they would have when he returned. I travel over 30,000 miles each year between making deliveries and hunting for good reclaimed or old growth lumber. It’s getting harder and harder to find good consistent sources at reasonable prices. I feel strongly that my good fortune in maintaining a strong business level is by providing great quality at very reasonable pricing. This could be as easy as one phone call or it could be several phone calls and emails until we come up with a final design. There is a new rhythm to the business since we entered into this economic downturn. My customers are taking far longer to arrive at a decision to buy. In the past, within a week of questions and discussions decisions were made, now it seems as if the pattern is at least 2-3 weeks. This requires a great deal of my time. (30%) I spend most evenings answering emails and all days making the tables. Crafting of the table parts, legs, aprons etc. 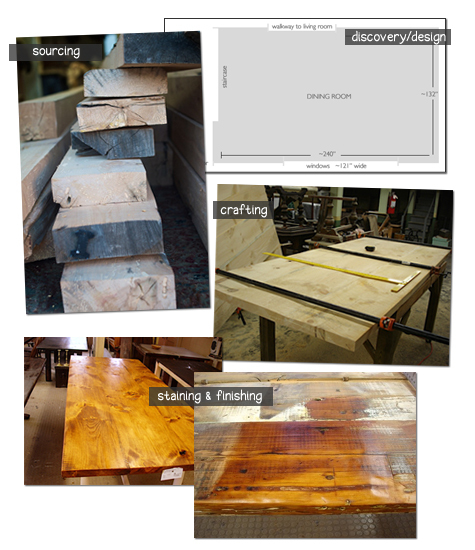 When using old lumber, building table parts becomes part of the individual shape and form of the actual custom table. I use hand built methods so standardization of table parts does not work well at all. I spend about 25% of the time it takes to make a table on the legs and aprons. The majority of the time (50%) is creating the table tops. Jointing and gluing the boards and then hand planeing and sanding to achieve the finish I am looking for. This step is a slow process as each application of stain, shellac and final seal needs at least 12 hours to dry and then sanding between each application. The final finish can take as long as five days even though each of the five steps takes less than an hour to apply. I send several emails along with photos, showing the progress during just about every stage of building. Whenever possible I love to deliver the tables. I learn so much from my customers as well as having the opportunity to discuss other projects from them. So happy to see Marichelle here. She has a great blog and a sweet and kind way about her. Love the table and the mash of chairs she found to put around it. Yah Marichelle. Love your blog so I’m sure it’ll be a fantastic week over here. Have fun and great first post. So cool to see you on Design*Sponge! :D Great interview too! I loved this table from the minute you originally posted a photo on your blog, Marichelle. How cool to get to know its maker! Wow what a wonderful interview! A great way to start off a Monday morning. I so enjoyed hearing about David’s work and life. The joy and love for what we does really comes through in his pieces! What a lovely post. I look forward to discovering your blog and David’s designs. His passion and warmth shine through in this interview. wow. This post brought tears to my eyes…hearing about all the love David puts into every piece. This is what your beautiful blog is all about my friend and this is my favorite heartlab ever. David sounds like a lovely soul and when the day comes that I need a new table, this will be the artist I would want it made by. Thank you so much,both of you and so happy to see you here my dear! What an incredible person you have chosen to feature. I loved your story from start to finish! A beautiful piece of furniture, only became more beautiful after listening to the history of the person responsible for creating it. David’s words also made me a little homesick of course, for good old England! this was so neat to read – thanks! Thank you so much for all of your comments. I’m so happy to be able to share David’s work – I can sing him praises all the long. I’m such a huge fan of his and it makes me so happy to be able to share his work with all of you. i’m so happy to see marichelle here on design*sponge. i love heart handmade and her. she’s such a warm and generous person. this heart lab is going to be a favorite for sure. the table is obviously gorgeous and i always love to learn about process. but, the career shift that david made is really inspirational to me and so timely during these crazy times. i agree that when you do something you naturally love, it’s not work. David is one of the most charming, kind and interesting people I know, whose beauty of soul shines through in his fabulous designs and workmanship. He will be the artist I will choose for the next piece of furniture I want. Your blog is wonderful! I recently ordered a table from david for a client/friend. The experience has been wonderful. He is extremely professional and goes above and beyond… I highly recommend his services! Thanks david! What a wonderful article and interview. Only last week I began speaking with David and ordered my own table for a new home and a fresh start. He has been more than a pleasure to work with and my home has a special place for his piece of art. 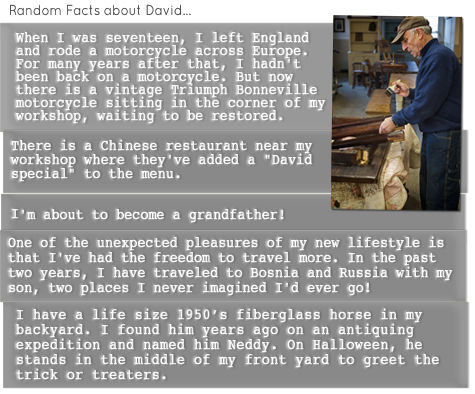 David brings talent, craftmanship, and old world charm to his workshop. 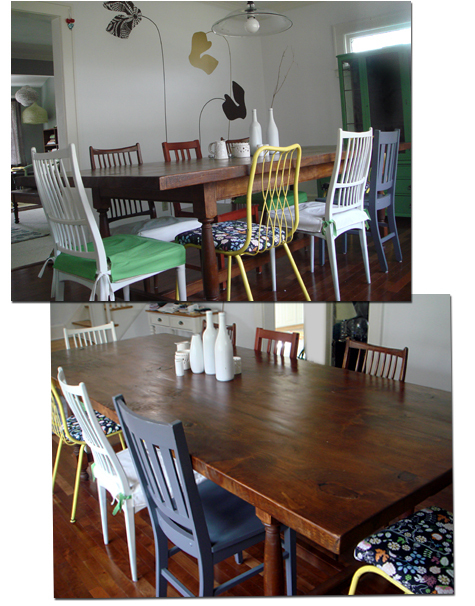 He created a beautiful farmhouse table and mudroom bench for us. We couldn’t be happier with the results. Terrific experience. What a great article about a true craftsman living his dream. You can tell that his work product is more than a piece of furniture. Each piece is a story that will be shared by many for a long long time. We are overwhelmed by this amazing article about a man who has truly realized his potential and talents!! Not only is David creative and accomplished, he has coupled his abilities with his charming personality. The fact that he documents the building of his tables every step of the way, and constantly communicates with the future owners, makes him a unique and highly sought-after craftsman. David has realized his dream, and we are all beneficiaries of his artistic achievements. Thanks, David!! we’re excited to have the Lorimer workshop as the newest member our out Etsy team Arts In RI!!! I just got my table from David on Saturday. It’s really fantastic and he’s a great guy. David, You’re such an inspiration. My fiance and I are doing the exact same thing right now, completely uprooting, re-routing our lives. Lovely goods by the way. Wishing you continued success and tons of happiness. My friend just bought from David Ellison and she loves her table! We’ve added him to our site because of his work and his ethics. I love your interview and will make sure we include it on his profile, which is to come! Love your blog! I just re-red this interview. What a great interview. Thanks, it made me reflect the beauty in Craftsmanship and people in general. Hi Marichelle, just reread your interview. Thank you again so much, you really captured many of the feelings I had and still have.